This beautiful scarf was spun and knitted by Doris Breitsameter, from Germany. Beverly Usher's Shawlette made 100% on her new Little Gem. "I have just finished (and worn today) the shawlette. The picture of the two bobbins before plying. I split the fibre in half, spun one half intact, and split the other into small strips to spin. The two bobbins show the difference really clearly!" Jean Mabon of Glasgow, is loving her brand new Majacraft Suzie Pro call Matilda - this was the first spin - very impressive. We look forward to seeing more. Beehives.....they are a lot easier than they look! Add a Wild Flyer to your Majacraft wheel to allow the fibre to move freely when making art yarns. Made using the small Majacraft Circular Loom. Available to purchase from http://www.thewheelewe.co.uk/new-products-2/circular-loo for £27. Link for instructions on making this, will be available soon. 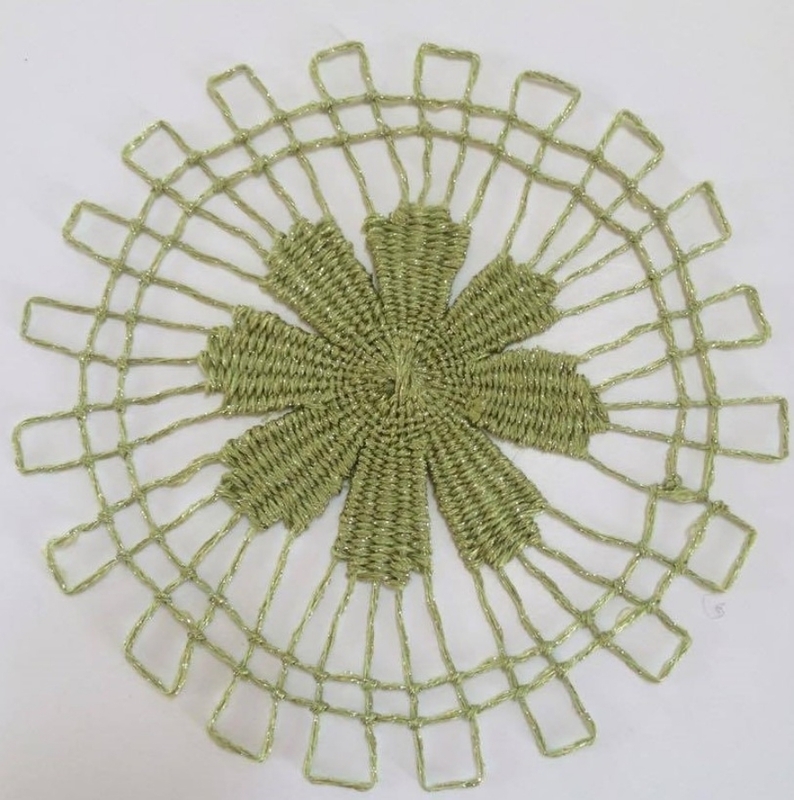 Using the 175mm circular loom, crochet cotton and the Teneriffe Knott, Click on the Image to purchase a circular loom. This was made using the large 450mm circular loom. Hand spun and dyed art yarn was used and the fringe was tail-spun yarn hooped on with crochet hook. Using the big Majacraft Circular Loom here (450mm) , I wove my sheeps face. I then used wool 'tops' and weave in his fleece. Then lightly needle felted his fleece to hold together.